Debby Ackerman (J.D. ’79) is a woman of many firsts. She graduated first in her class from St. Mary’s University School of Law. 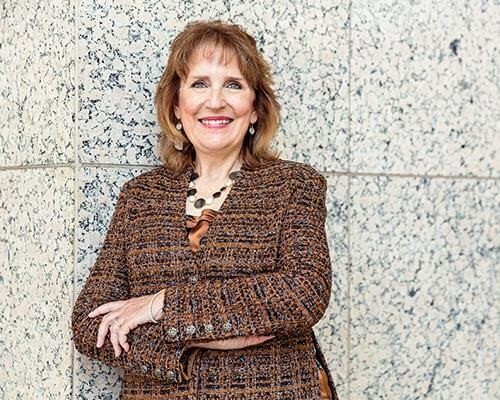 Her interest in corporate and securities law led her to the San Antonio law firm Oppenheimer, Rosenberg, Kelleher and Wheatley, at which she was the first woman to become a partner. She followed others from the firm to Southwest Airlines, and rose to become the airline’s first female general counsel in 2001 — just a few months before the terrorist attacks of Sept. 11. In that new role, she handled a round of resulting legal issues that permanently changed the airline industry. “It turned out being the end of the world as we knew it in many significant ways for the airline,” said Ackerman, who retired from Southwest Airlines in 2007 only to be lured back to part-time work in 2011 to a unique position for Strasburger & Price LLP in Dallas. At Strasburger & Price, she draws on her own experiences to mentor young women lawyers in business development and workload management in hopes they’ll stay with the firm. She has yet to come across a similar mentoring program elsewhere and said finding the right mentor might be part of the formula for success. In the 1970s, she was a legal secretary while her first husband attended law school in Dallas. When they moved to San Antonio, she began attending St. Mary’s Law. When Ackerman gave birth to her older daughter while working at a firm, she said the firm struggled to pay her during maternity leave. She ended up going back to work when her daughter was 7 weeks old. By the time she had her second daughter, she was working at Southwest Airlines and had planned to take three months off. When her daughter was 6 weeks old, the treasurer of the company suddenly left and Ackerman got the call that the company needed her back on. Ackerman described challenges that came after Sept. 11 — the airline was shut down for three days. They also had to address agreements with unions and manufacturers, plus deal with regulatory issues. “I worked 12 hours a day for nine weeks. It was one of those things you just pour yourself into,” she said. Ackerman said “it’s a blessing” to be able to provide help to a new crop of women lawyers. Thus far, the retention rate for her mentees is positive with only one having left her position after having a third child. Two of her mentees have become equity partners, and several more have become income partners. Occasionally, a man will ask her why the firm needs a women’s initiative.